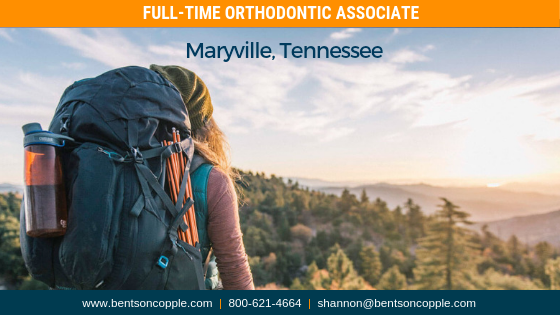 A growing practice dedicated to creating beautiful smiles is seeking an orthodontic associate to join their team in Maryville, Tennessee. Maryville is located between the Great Smoky Mountains National Park and Knoxville, the state’s third largest city. Maryville, situated in Blount County, is ranked as one of the top ten cities to live in the state of Tennessee. Blount County’s school systems have received the State Department of Education’s Governor’s A+ Award for community commitment to excellence in education, with Maryville and Alcoa City School Systems typically ranked #1 within the state. Blount County residents enjoy a high quality of life due to the many outdoor amenities it has to offer residents including waterways, national parks, an abundance of outdoor sporting events and community festivals. Located just 30 minutes south of Knoxville, Maryville provides a small town feel with ‘big city’ amenities. Blount County continues to experience tremendous growth in jobs, housing, and opportunity. If you are looking for a place to grow yourself and your family, offers an active outdoor lifestyle with the Great Smokey Mountains in your backyard, and a fabulous community then this is the one for you! The ideal candidate is available by summer 2019 and eligible for Tennessee licensure. To learn more about this opportunity, please forward your CV and letter of interest to shannon@bentsoncopple.com.